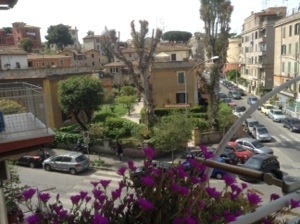 Heading back to Accra after some days in Rome, in our neighborhood of Garbatella. In Caro Diario, Nanni Moretti drives through this archway on his Vespa. Garbatella is getting trendier, which still seems odd, but is still a great place to live and visit. Piazza Eurosia in sunshine, with Roman fragments. Via delle Sette Chiese. Oh yes, and I baked! I actually doubled this and made one big and two small loaves, but here is enough for one. Mix all this up, to a shaggy mess and leave it on kitchen counter with bowl covered for a few hours while you go for apertivi. When you are back, fold the dough over itself with a spatula for a couple minutes, until you have a firmer dough ball that can be tipped over into parchment paper. Lift that into a bowl or baking tin, cover it and leave in fridge overnight to rise. Next morning, heat oven to 250C and bake for 25-30 minutes. Cool before slicing, and enjoy! This entry was posted in baking and tagged bread, Garbatella, no-knead on November 29, 2018 by krumkaker. It is a quiet Sunday morning in Rome, and we have a lunch invitation from friends with a private garden. Private gardens are rare here, as most of us live in flats, and even a large terrace is a luxury, though in most films set in Rome everyone seems to have rooftop terraces with stunning views. We like our little balcony, where I grow herbs and dry laundry, and where friends can smoke and watch the traffic. Still, on a sunny spring like today, it will be glorious to go out for lunch, to drink prosecco in the sun, while the barbecue sizzles and we enjoy the company of good friends. They live near the Appia Antica, so we may end up there later. I should probably excavate some sunscreen, and a hat. 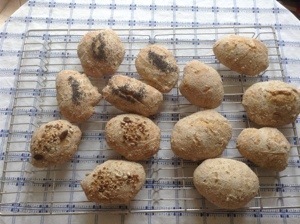 As my contribution, I am bringing these easy sourdough polenta bread rolls. The evening before: mix the ingredients, and stir. Cover bowl with a shower cap. 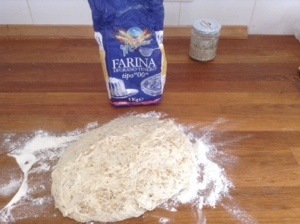 Leave for half an hour, then add salt and fold dough in bowl (a spatula or spoon works for me). Enjoy dinner and a couple old episodes of Black Books, and fold the dough a few more times. You will see the dough developing structure, and increasing slightly in volume. This is a typical 500g flour/350-400g water recipe, it generally works for both yeast and sourdough baking. More water may be needed, depending on the flours used. I added polenta this time, just for a little extra crunch. 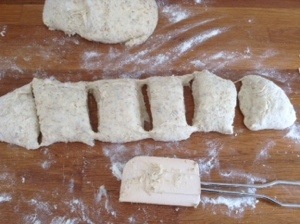 Divide the dough in half, and roll it into a rough sausage shape. It will be quite sticky. Using a spatula or knife, divide each roll into 6-7 pieces. You could roll these into a nice tight shape, using more flour, but I wanted a more rustic type roll and just dolloped then onto a baking sheet with baking parchment. Optional: sprinkle some seeds on the rolls, pressing down slightly so they do not fall off. Let rolls rise 20 min or so while oven heats up. A very good Sunday to you all! Notes: I started the dough last night, you could swap out the sourdough with 1 dry yeast and make it the same way. I added seeds to only half the bread rolls, as there will be small children present at the lunch who are not fond of seeded bread. This entry was posted in baking, food and tagged bread, no-knead, polenta, rolls, sourdough on April 13, 2014 by krumkaker. Yesterday I made carrot soup with red lentils and miso, for an ad hoc visit on a rainy afternoon. 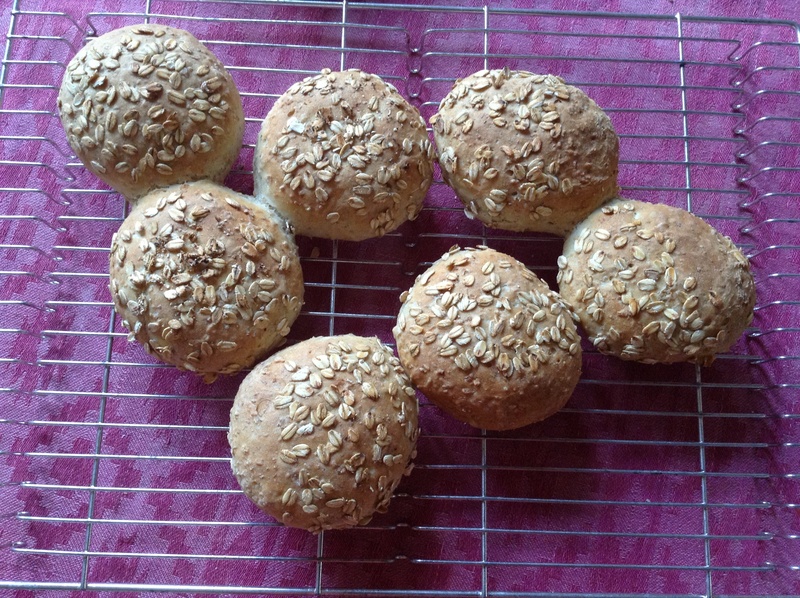 I also made these rustic bread rolls with oatmeal, so the meal was not just soup and the remnants of my mother-in-law’s Christmas cake….. So delicious, but so calorific! This dough was made with scalded oatmeal.In Norway it’s not unusual to bake with scalded rye flour, as rye and oats have better flavor and the bread consistency changes a bit. Scalding rye gives a much more glutinous texture than scalding oatmeal. Using left over oatmeal porridge would work as well, probably, just add less salt. Boil up 100 grammes of water, and pour this over 50 grammes of quick-coking oatmeal, to scald it. Leave to cool a few minutes. 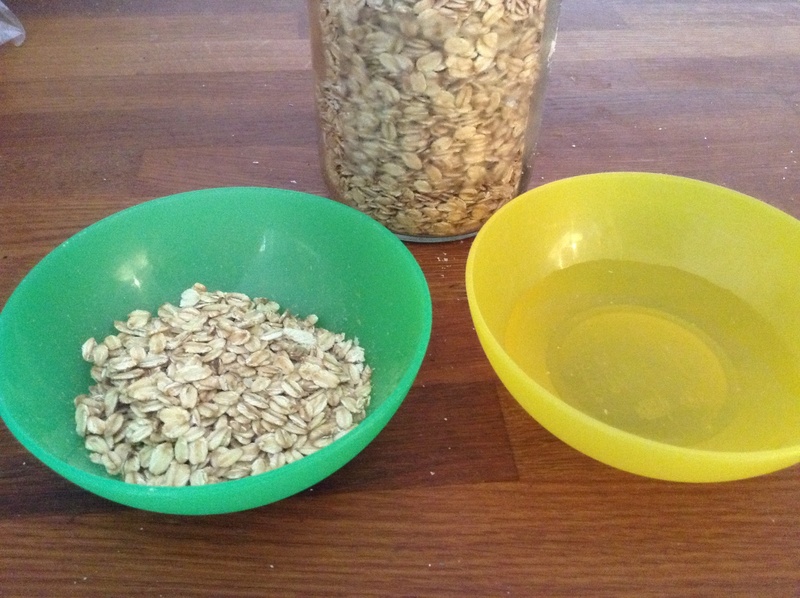 Once the scalded oatmeal has cooked down a bit: add flours, cool water and olive oil to a bowl. Stir, and make sure the mix is not too hot (lukewam is fine). Add dry yeast and olive oil, mix again. Leave to rest ten minutes, then fold dough in bowl and add salt. Leave dough for an hour at room temperature, folding every twenty minutes (or maybe just once, if you have popped to the supermarket – the dough will survive). Once the dough has doubles and looks light and fluffy: Divide dough into 12-14 pieces. Roll out to a small bun, trying not to use too much extra flour. 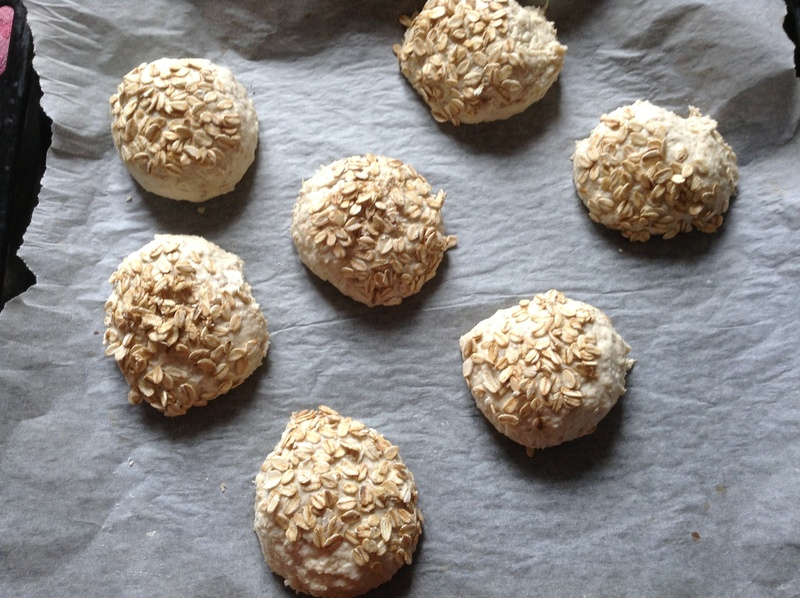 Dip each rolled ball of dough into the small bowl with water, then the into the small bowl with coarse oats, pressing slightly so the oats adhere. Place with oats side up on a baking tray with baking parchment. Leave to rise 45 minutes or so, depending on the temperature of your kitchen. Cover tray with a tea towel. You will see the bread rolls gently rising. Heat the oven to 240 C.
Bake in the middle of the oven, 10-15 minutes at 240C. Cool for at least 15 minutes before slicing. Very nice with butter. Notes: I tried at 225C first but after 20 minutes they were not yet done, so the second tray was baked at 240C. My oven is not the best. They might be nice with more salt in the dough (try ten grammes) but I’m trying to cut back…. and with the carrot miso soup, the bread rolls were delicious. 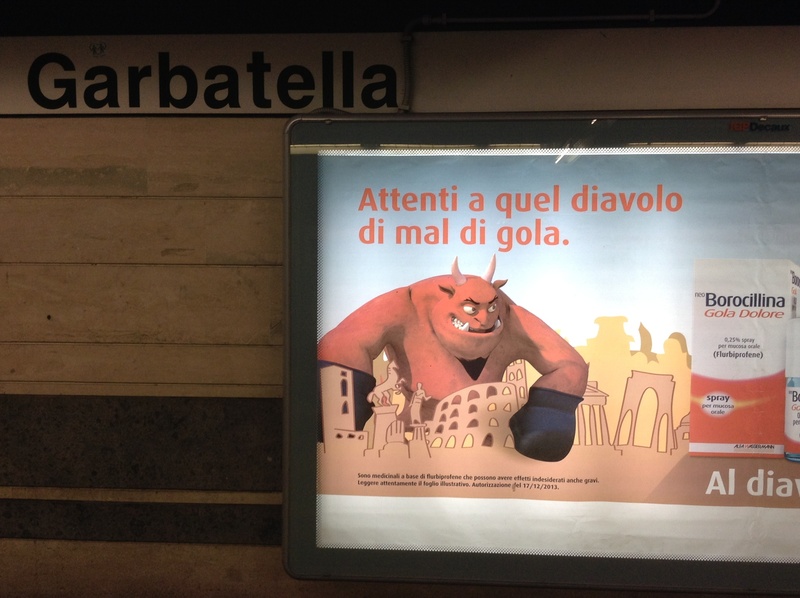 PS Could not resist this medicinal add at the metro the other day, with the devil among Roman monuments. ” Mal di gola” is sore throat. This entry was posted in baking, food and tagged bread, no-knead, oatmeal, rolls on January 20, 2014 by krumkaker.